Startupedia: What is Guerrilla Marketing? What does "guerrilla marketing" mean? Guerrilla marketing is all about the element of surprise. It requires breaking away from traditional marketing conventions to create a high impact, low cost campaign. Ever heard of the ALS Ice Bucket Challenge? Pre-2014, if I'd asked how many of you had ever willingly dumped a bucket of ice over you head (or knew someone who had) you'd probably look at me like I was nuts. But last year, thanks to a funding-campaign turned viral social media sensation, the ALS Association raised more than $220 million towards finding a cure to Amyotrophic Lateral Sclerosis (ALS). This campaign was so large it attracted the attention of major influencers such as Oprah Winfrey and Bill Gates who both participated and donated to the cause. Another commonly cited, successful guerrilla marketing campaign was conducted in Paris by Médecins du Monde, an international humanitarian organization. In order to highlight the alarming number of homeless people people living in the city, the group distributed 300+ "two second tents" to provide shelter. When groups of these tents started popping up all over the city, and the reality of the situation was brought to light, the public was outraged and-- finally-- forced the government to act. As a result, nearly $10 million was allocated for emergency housing. Finally, in an industry making multi-million dollar blockbuster movies, a group of university students used a clever guerrilla marketing tactic to create hype around their film The Blair Witch Project. Unlike a lot of its rivals, the film had no Hollywood stars and no script. It centered around the disappearance of three student filmmakers, and the audience was expected to believe the movie was the uncovered video documentation of what happened prior to their disappearance. The filmmakers cleverly designed a web page devoted to stories of The Blair Witch - a fictitious character - to create a following for the film. The news spread and people began to believe The Blair Witch was real, and that the contents of the film actually happened. As a result it grossed $250 million worldwide-- not bad for a film that cost only $50,000 to make! It's all about making an impact! IWC, a Swiss watch manufacturer, placed stickers of their Big Pilot's watch on the arm straps of Stuttgart Airport shuttles, giving passengers a chance to try the watch on and see what it looks like. Frontline crated a giant dog image and placed it on the floor of a mall in Jakarta, Indonesia. From above, people walking across the image look like fleas creating a very memorable visual image! To advertise their new flashlight, Duracell cleverly superimposed an image of their product onto high-power light sources to show their comparability. This bus graphic is certainly impactful! 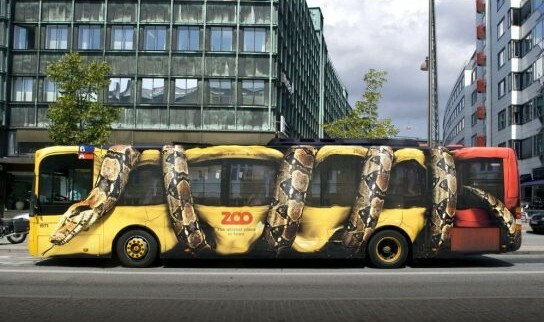 So much so, that some snake-averse bus passengers refused to take the bus! If you're an aspiring marketer or growth-hacker looking to make a splash for a startup company, read our post on the 4 marketing books all startup employees should read. Or, check out our full or part-time marketing courses. Download the full-time course guide, below.